Buried deep in the Siberian permafrost and untouched for over 30,000 years, researchers have discovered what is thought to be the newest representative of what are loosely known as "giant viruses." A team led by Jean-Michel Claverie and Chantal Abergel of Aix-Marseille University in Marseille, France, made the discovery of the previously unknown virus, which has been dubbed Pithovirus sibericum and can be revived in the lab. Their findings are detailed in a new article in the Proceedings of the National Academy of Sciences. Lest Siberian excavation makes you think of frozen woolly mammoths, make no mistake: These giants are still decidedly microscopic. But in the diminutive world of viruses they're larger than normal specimens, measuring 1.5 microns in length and 0.5 microns in diameter. The pandoraviruses, the largest viruses previously discovered, also by the team of Claverie and Abergel, measure 1 micron in length and 0.5 in diameter. "Giant' viruses are loosely defined as the ones that you can see under a regular microscope," explained Claverie and Abergel. Giant viruses also dwarf other viruses in terms of genetic complexity. The newly discovered Pithovirus contains 500 genes, and the aforementioned Pandoravirus can contain up to 2,500. Amazingly, even after more than 30,000 years embedded in ancient permafrost, when Claverie and Abergel exposed amoebas in their lab to the virus, they found that the virus was still active and quickly infected the host cell. "We use amoeba on purpose as a safe bait for capturing viruses. We then immediately verify that they are not able to infect animal/human cells," stressed the researchers. 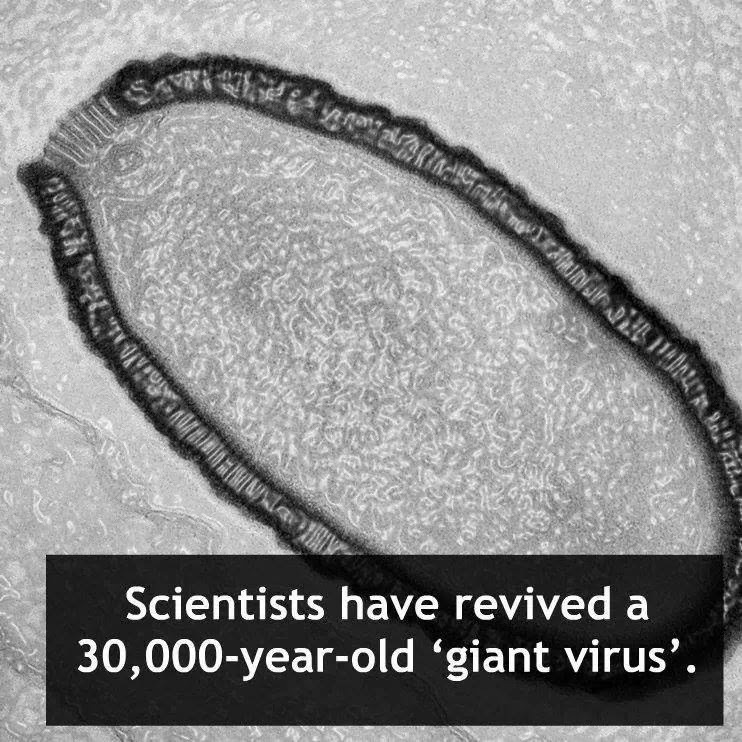 Giant viruses are not just bigger but are hardier than others as well, said the researchers. This hardiness, along with a favorable environment, likely helped the newly discovered specimen stay intact for the thousands of years that it did. Viruses are often destroyed or rendered inactive by a number of factors, including light and biochemical degradation. "Among known viruses, the giant viruses tend to be very tough, almost impossible to break open," said Claverie and Abergel. "Special environments such as deep ocean sediments and permafrost are very good preservers of microbes [and viruses] because they are cold, anoxic [lacking oxygen], and in the dark." If long-buried viruses can be unearthed, what else might be capable of coming to the surface? Climate change as well as industrial activities may shake up the ancient ice enough to bring potential pathogens to the surface. Edward Mocarski, a professor of microbiology at Emory University, says the risk of a virus pathogenic to humans being released from the ice is very small. "A very small proportion [of the viruses on Earth] represent viruses that can infect mammals and an even smaller proportion pose any risk to humans." University of Nebraska's Van Etten agreed that such a situation was unlikely but possible with the right conditions. "The biggest source of genes on the planet is probably from viruses, and they're just everywhere, but in general they're highly specific for the organisms that they grow in," said Van Etten. The researchers behind the discovery, Claverie and Abergel, believe that whether or not it's likely, such a scenario remains feasible. They counsel vigilance and continued testing. As their latest research has shown, large DNA viruses may remain infectious for very long stretches of time. "The fact that we might catch a viral infection from a long-extinct Neanderthal individual is a good demonstration that the notion that a virus could be 'eradicated' from the planet is plain wrong and gives us a false sense of security. At least a stock of vaccine should be kept, just in case," said Claverie and Abergel. Their research will now turn to assessing how real a threat these ancient viruses pose. "If we find some [human pathogens], then the risk will become more real. If not, we will be safe."